Chalford is justiﬁably proud to have one of the best bandrooms in the country – particularly as it was purpose built ‘by members and community goodwill. For 103 years the band rehearsed in various rented premises but change was necessary when the France Congregational Churchroom closed prior to conversion into homes. To begin with a trailer was used to store and take heavy kit to various temporary places, latterly the Whiteway Village Hall. Because of the inconvenience it was soon decided the best solution, however challenging and daunting, was to build a new bandroom. Luckily there was support from all the right quarters. Chalford Parish Council agreed, subject to the approval of the Charity Commission, to let the band have a 999-year lease of some vacant Chalford Hill allotments and tenor horn player Douggie Gunn, an architect, drew up some splendid plans, which were approved by Stroud District Council. Everybody worked hard under the hands-on leadership of conductor Ken Wear and chairman Derrick Witts. Various talents and skills among the players, supporters and local tradesmen were used and a lot of the materials, including double glazed windows, were donated so the cost of the project was kept incredibly low — in the region of £20,000. Local authority grants and band fundraising covered the cost. No loan was necessary. 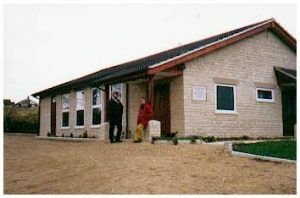 lt was a dream come true when the band moved into the magniﬁcent new headquarters, with its large rehearsal or performance hall, library/storeroom, toilets and other storage space, plus a large car park, all adjacent to the allotments and the village playing ﬁeld with” lovely views over the valley”. 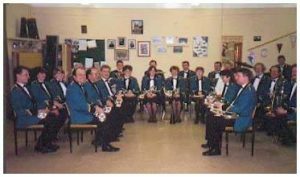 September 24, 1988, was a memorable day when the bandroom was ofﬁcially opened by Paul Dutton, chairman of Chalford Parish Council. A large gathering was welcomed by the band chairman, Derrick Witts, after the band’s opening items, King Cotton, Pastorale and Prelude for an Occasion. “Today is probably the most important event in the history of Chalford Band,” said Derrick. The council chairman said the council was pleased to have been involved in the provision of the new headquarters. The band then played Constructions, a piece composed for the occasion by Steve Tubb. The title had been suggested by percussionist Elaine Williams – the winning one of 20 entries in a competition. Ken Wear told the gathering the new bandroom reﬂected the conﬁdence which the local community had shown in the band. The ceremony concluded with the march Wellington.